/ 2019 Mares Puck Pro vs Puck Pro Plus. Does it have Bluetooth? 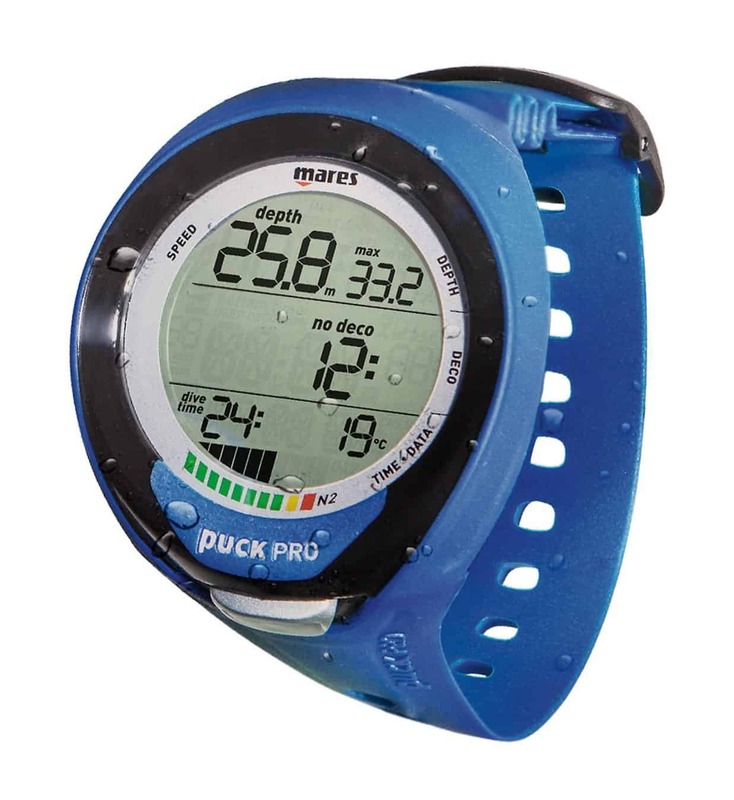 The Puck Pro dive computer is Mares entry level dive computer. 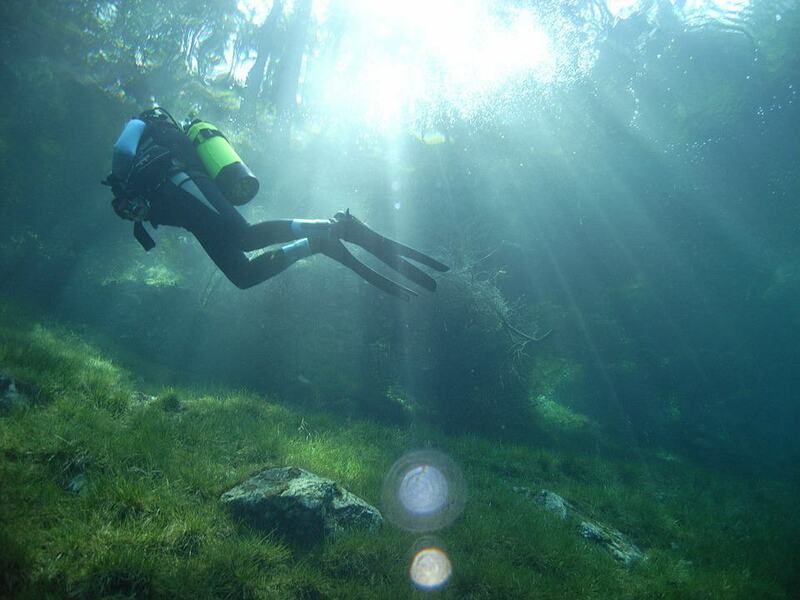 It's aimed at recreational divers as well as beginners. With 3 diving modes, the Puck Pro comes in a variety of colors and is a great dive computer for both functionality and price. In this review, we explore the features and functions, and compare it to other popular entry-level dive wrist computers. Click the link below to go to the answer of your most pressing question, or keep scrolling to read the entire Mares Puck Pro review. What's the difference between the Mares Puck Pro and the Puck Pro Plus? How does it compare with similar Dive Computers? Is it really the size of a hockey puck? How easy is it to navigate a One-Button Menu? What's the expected battery life and is it user-changeable? Which Algorithm does the Mares Puck Pro use? Which functions is the Mares Puck Pro Plus missing? What about Maintenance and Care? It’s great to see some entry level dive computers attempting to move towards modern wireless connectivity! 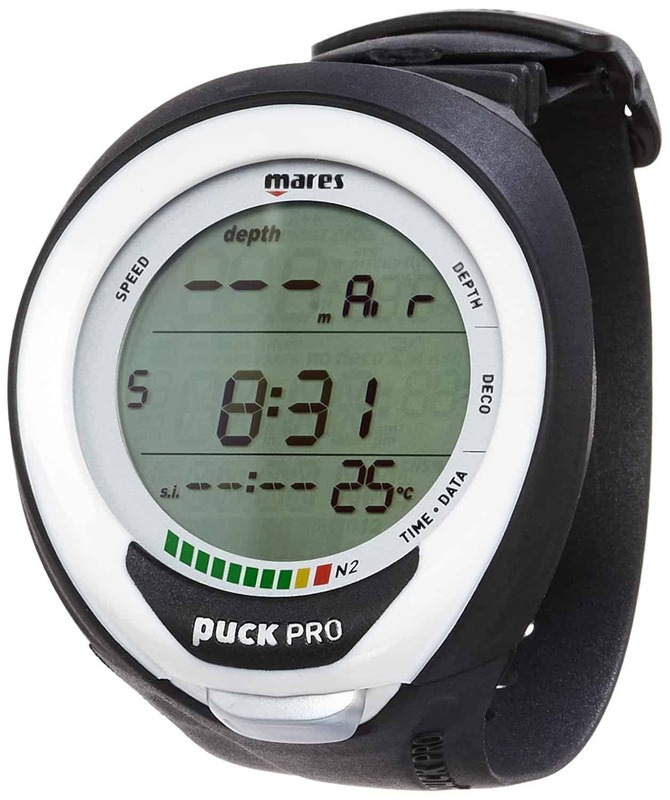 Mares released the Puck Pro PLUS around 12 months ago. The Puck Pro Plus has seen upgrades with regards to the connectivity and adaptability. The Mares Puck Pro PLUS comes with a form of Bluetooth which Mares is calling BLUE LINK. It is a Bluetooth clip connector that lets you download dive data directly to your smartphone. However the linking cable is not included with the Puck Pro Plus and is a separate, additional purchase. By all reports the Bluetooth Adapter is having teething problems, and still needs some developing before it becomes user-friendly or worth recommending. Aside from the touted wireless Bluetooth capability, there are only cosmetic differences between these two models. The Mares Puck Pro comes in a range of colors available. The Mares Puck Pro + is currently available to buy online in Black or White. There is a Grey option but this is yet to become available to purchase online. All of the functions of the two models are exactly the same. If you already have a Puck Pro and want to buy the USB cable to download your diving logs, the software is free to download from the Mares website. Another great open-source option worth looking at is Subsurface. The download cable also allows for firmware updates to the Puck Pro that Mares release from time to time. When it comes to entry-level dive computers there are 3 models that are usually mentioned in the same breath. These are the Mares Puck Pro, the S﻿﻿uunto Zoo﻿﻿p and Cressi's Leonardo. This is because these are very similar when it comes to both functionality and reliability. All these dive computers are high quality with only slight differences between them. Most entry-level diving computers in this price range do NOT include the USB cable needed to download dive information. This is an optional accessory and is not included in the purchase price of the Leonardo, the Zoop Novo or the Puck Pro Plus dive computers. The Deepblu Cosmiq+ does have Bluetooth connectivity. ​The Suunto Zoop Novo is more expensive than the Puck Pro and Leonardo, but it has more features as well. If you have a little more to spend then take a look at the Zoop Novo Comparison and review. You really need to work out what features you want, and just go for it. Entry-level dive computers are always in demand and generally hold their resale value well. They'll also serve you well as a backup dive computer if you decide to extend your training later on. The Mares Puck Pro Plus is a big dive computer. The case is 2 ⅓ inches (or 60 mm) in diameter by 1 inch thick (25 mm). You won’t get away with wearing this as an everyday watch as it really is almost the size of a hockey puck. Its overall size makes it very easy to read underwater. It has a segment display which has a backlight and the display is mineral glass crystal. It's a good-looking and durable design. The Puck Pro Plus wrist computer looks a little more stylish than its predecessor. Both have a black rubber watch-style strap that is long enough to go over your wet suit or dry-suit. The Puck Pro Plus has a one-button style menu operation. The menus are easy to navigate. Press the button to scroll through the menus, then hold the button to make adjustments to the menu you're in. This single button menu operation is a nice touch, which is easy to press even with gloves on. When in Surface mode you can change settings, use the dive planner, see remaining saturation after a dive, review your logbook and download to a PC or Mac. The dive settings can't be changed once you're underwater. During the Dive mode, the Puck Pro Plus monitors the depth, time, temperature and performs the decompression calculations. Although it monitors your depth, the Puck Pro does not have a Depth alarm. This may be important to know for anyone who has restrictions on their diving depth due to medical or other reasons. The backlight can be adjusted to display between 1 to 10 seconds before fading, to help conserve battery life. It can also be set to ON so it remains on until you press and hold the button again. The Puck Pro and Puck Pro Plus has a Rapid Ascent alarm (based on 30 feet per minute), and it alerts you if you miss a decompression stop. The Puck Pro Plus always switches on in pre-dive mode. This mode puts the dive computer in a ready-to-dive mode. It checks the ambient pressure during pre-dive. It won't begin to calculate a dive until submerged below 4 feet (1.2 meters). Once submerged, pressing the menu button will activate the back light and light up the display. After surfacing the dive calculations are paused. This resumes if you re-submerge within 3 minutes and it logs the time on the surface as part of the dive. Once past 3 minutes on the surface, the Puck Pro closes the Logbook for that dive. The display then shows desaturation time, no-fly time and the surface interval. It will continue to show the desaturation and no-fly time until both are reduced to zero. If you're diving in lakes above sea level, the Puck Pro comes with an adjustable Altitude setting to 3,700 feet. This needs to be manually adjusted. The Puck Pro Plus lets you switch between imperial or metric depending on your personal preference (meters and Cº, or feet and Fº). It can be set in either show either 12 hour or 24 hour format. The Puck Pro PLus has a great Dive Planner. 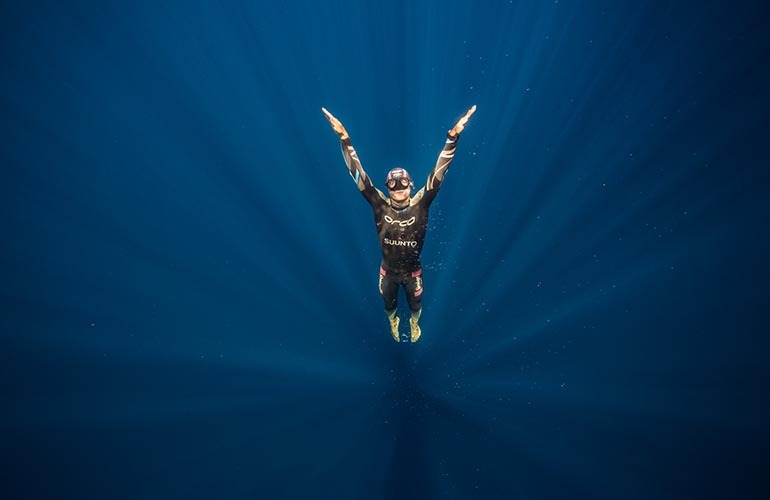 When entering your intended dive depth, it calculates how long you can stay at that depth. This is based on your last dive, surface interval and desaturation time. The algorithm adjusts the no-decompression time by assuming you've spent the entire time of previous dives at the AVERAGE depth. The Log holds around 35 hours worth of dive time, sampling at a rate of 5 seconds. You can't delete old dive data, you have to wait until it deletes itself out. You'll need to transfer this to a Dive Log to keep the information. On their website, Mares state that the battery of the Puck Pro and Puck Pro Plus is user-changeable. On both dive computers, the battery compartment is sealed off from the other part of the computer. This means it won't flood the rest of the computer if this isn't sealed correctly. The battery is a standard 3 volt CR2450 on both models. The battery life is estimated to be somewhere between 300 to 500 dives. This varies depending on how you use it. Diving in cold water, use of the backlight and the beeper will increase the battery consumption. The battery icon doesn't show while it has plenty of charge. The icon will appear as a steady symbol as the battery starts to run low. There will still be enough charge for a few more dives, but you'll need to consider changing the battery shortly after the symbol appears. The backlight function will stop working once a low battery warning is activated. The battery icon blinks when there's not enough battery for diving. Once the icon starts blinking, the Puck Pro doesn't function very well and won't turn on underwater when the battery symbol is blinking. The Battery Kit comes with a new battery door, a new o-ring seal, and a CR-2450 3v battery. The video below shows how easy it is to change the battery on the Mares Puck Pro. The Mares Puck Pro and Puck Pro Plus use the RGBM (Reduced Gradient Bubble Model) algorithm. This algorithm is considered a more conservative algorithm and is great for beginner and recreational divers. Later on if you want to expand on your training and move into more technical diving, then you'll need to explore dive computers with different algorithms. The Puck Pro Plus has a Precautionary Program setting which allows for adjustment to more conservative profile settings. This is good if diving at different depths over multiple days. The Mares Puck Pro Plus is marketed as an entry-level dive computer, so it has all the functions beginner divers or recreational divers need. It doesn't have a Depth alarm which you may need be aware of for medical reasons. The Puck Pro Plus doesn't have wireless Air Integration. If you're after wireless air integration, have a look at some of our other reviews on mid-level diving computers. Don't forget though, more advanced features will add to the cost of a dive computer. This is an affordable entry level wrist diving computer. If the Puck Pro Plus remains in a pre-dive mode for longer than 10 minutes without the button being pressed, the computer switches itself off. You need to make sure the Puck Pro Plus is switched into pre-dive mode before submerging. If you start a dive without doing this, the Puck Pro Plus will still start to monitor the dive automatically, but with a delay of up to 20 seconds after submerging. It doesn’t have a digital compass, trimix or a Depth alarm. If you’re after more advanced features, then have a look at the Suunto Vyper Novo, Suunto D4i Novo or D6i Novo, or the Shearwater Perdix AI. The Mares Puck Pro is very nicely priced for an entry-level wrist computer. This comes with a 2 year Manufacturer’s warranty. The USB cable accessory needed to download the dive data from the Mares Puck Pro to your laptop is an optional extra which will is rapidly dropping in price thanks to the release of the bluetooth capable Puck Pro PLUS. The cable currently costs around $50. The software is free to download directly from the Mares website. However it is a separate purchase as it doesn't come with the dive computer. The Mares Replacement Battery Kit will cost around $15 and includes the battery, o-ring, and a fresh battery case. When it comes to getting the best performance and longevity out of your equipment, always thoroughly rinse the computer in fresh water after each dive. Dry off and store in a cool, well-ventilated place away from the damp. The condition of the band, clasp and metal components need to be regularly checked. Over time these can become affected by a build-up of sunscreen, perspiration, and sea-salt. For peace of mind and to avoid problems or disappointment before a dive trip, have the dive computer serviced every 2 years. The computer functions, the waterproof seal, and calibration should all be checked. 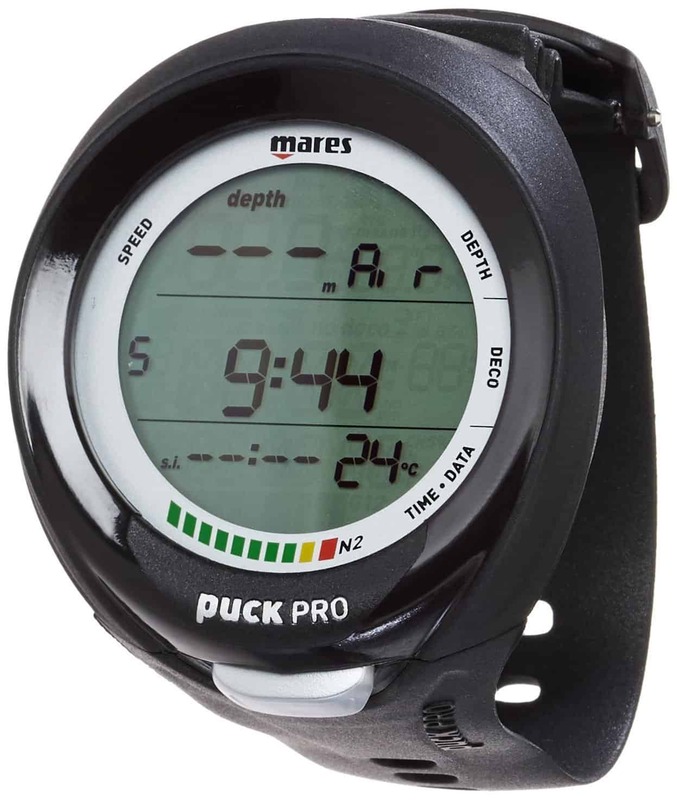 The Mares Puck Pro PLUS has the functionality beginners and recreational divers need. The one-press menu button and menu navigation make it a great entry level dive computer. If you've been looking for a new scuba computer and have your eye on the Puck Pro then there are some really good deals to be found online at the moment. Work out which features you really want from your dive computer, then go for it! I really like the size of the Mares Puck Pro. Am I right in guessing it is between the size of the Cressi and the Zoop? Hi Sue, The Mares Puck Pro slots right in the middle of the Zoop and the Leonardo in size. These are all big dive computers. Hi , thanks for the review. i am new to diving, so i really like the function of the dive planner and logbook memory. to be able to have all the details worked out for me while i am on my dive is great. the price is good too, as i am trying to buy the rest of my gear. The Mares Puck Pro is a pretty interesting piece of technology. Amazing how far things have come to help keep diving safe. Thanks for all the great info. The comparison chart helps work out which DC will work best for me. I like that it can do both metric and imperial, but it would be a great idea to include a depth alarm as well. The colors are good too. Wow, dive computers. I am no diver or tech guy, but the technology I see here is amazing. Inspired stuff. 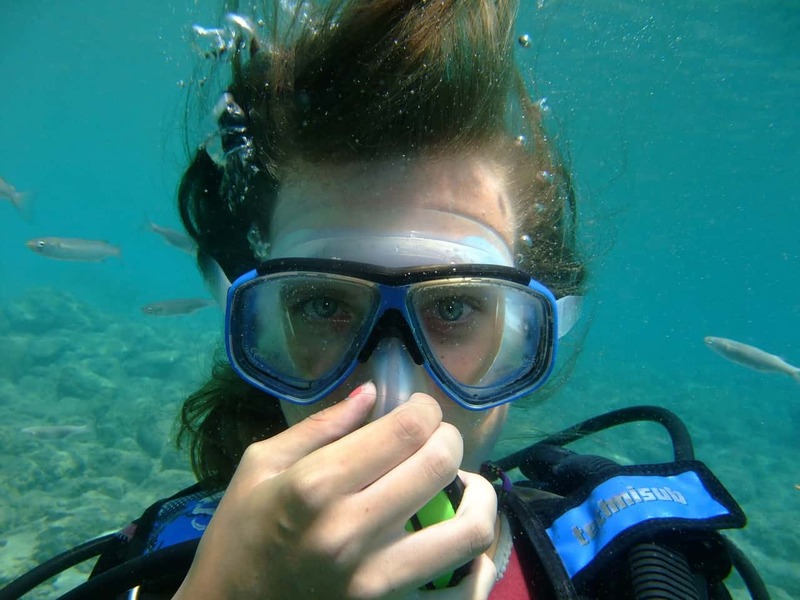 I recall living on Koh Lanta in Thailand for a month – big dive spot – and our neighbor who was an instructor wanted to get us in the tank. Next time, I am in. Hey Ryan, a month on Koh Lanta sounds fantastic! Let us know how you go when you decide to take the plunge and give diving a go. I’d love to hear about it. Cheers. Because of the Bluetooth confusion with the Puck Pro +, I contacted Mares support, and got this response back. “Sorry for any confusion! The Puck Pro + can transmit logbook information via a Bluetooth clip called ‘Blue Link’, sold separately. This clip will be available in 2018. BTW, thanks for the brilliant review. I decided to go ahead with my purchase, as the USB connection does everything I need anyway. Thanks for sharing! It feels like Mares are teasing us with this. I’d been trying to find more information about the Bluetooth connection and how it works without much luck. I’ll update the review and keep an eye out for when the Blue Link clip comes out for sale. Hi again Sharon, just to bring you up to date with what I now know. Firstly, thank you very much for personally putting in the time to help me solve this riddle. After more exchanges with Mares Support, I was able to gather up much more information about “Blue Link”. “Blue Link, available from 2018, sold separately” has now been added to the text on the Mares News page on the Puck Pro + page. The Bluelink connector, which is sold separately, replaces the old USB connector. It operates the same as every other blue tooth device and is approximately the same size as the current USB connector, and will retail at around the same price. It will be available for the Puck Pro, Puck Pro + and Quad computers. It has driver software for both Macs and PCs. So the main difference is the fact that the existing device has a USB cable, and this new one is paired via Bluetooth and doesn’t need a cable. I went for the USB cable version as it is available now, and works just fine. One source told me that the “Blue Link” connector is available now, but I couldn’t find it on the Mares site, or anywhere else that I searched. I have the bluelink adapter and it’s quite a disappointment. It doesn’t appear as a Bluetooth device, it only seems to be intended to connect within the software. The problem is the abysmal software. I have a Mac and I use iOS devices. The Mac needs a driver (when was the last time a Mac needed to install a driver!?) The Mares DiversDiary simply doesn’t connect. There is no software support for Mac users at all on the website. You have to email support and they don’t answer. With iOS it connects only to the SSI app, unless you pay $15usd for a 3rd party app it will connect to. None of the software will allow a sync to a Mac unless you pay for 3rd party software. Windows users are having similar problems. So the Mares software that goes with this simply doesn’t work. They desperately need to use professional developers to create working software solutions. I wouldn’t buy it like it is now.